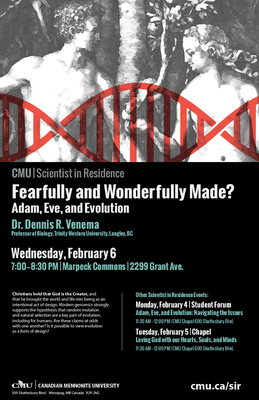 Dr. Dennis R. Venema (PhD, University of British Columbia) is Professor of Biology at Trinity Western University (Langley, British Columbia, Canada). He is co-author, with theologian Scot McKnight, of Adam and the Genome: Reading Scripture after Genetic Science (Brazos, 2017). Evangelicals are in the midst of a spirited debate about Adam and evolution. Do we share ancestry with other forms of life? Do all humans descend from a specially-created couple? How do Christians who accept evolutionary biology harmonize their faith with the findings of science? Christianity has a long history of studying creation as an act of worship, and the Christian conviction that nature is ordered by God was a significant factor in the development of modern science. As believers, how can we honour God in the present day as we explore His creation? Christians hold that God is the Creator, and that he brought the world and life into being as an intentional act of design. Modern genomics strongly supports the hypothesis that random mutation and natural selection are a key part of evolution, including for humans. Are these claims at odds with one another? Is it possible to view evolution as a form of design?